Clone is a virtual reflection of a tracker. Clones perfectly suit in case you need to give somebody else the right to track and monitor your trackers but limit this person in actions. For example, you have registered all your trackers in one User Account (main User Account), but need your colleagues to be able to monitor and supervise particular groups of trackers (couriers, sales team, etc.). For such purposes, you can create separate User Accounts for your colleagues in the Admin Panel and clone needed trackers into their accounts. The major difference between clones and trackers is that the owner of clones is a bit limited in actions. User who owns trackers can manage and change their settings and configuration. User who owns clones can perform only basic actions (i.e. using basic features in the User Interface) with no ability to change any of their configuration and settings in the Devices application (i.e. tracking mode, parking detection, and other settings). How do I create and manage clones? Clones may be created in the Admin Panel only. 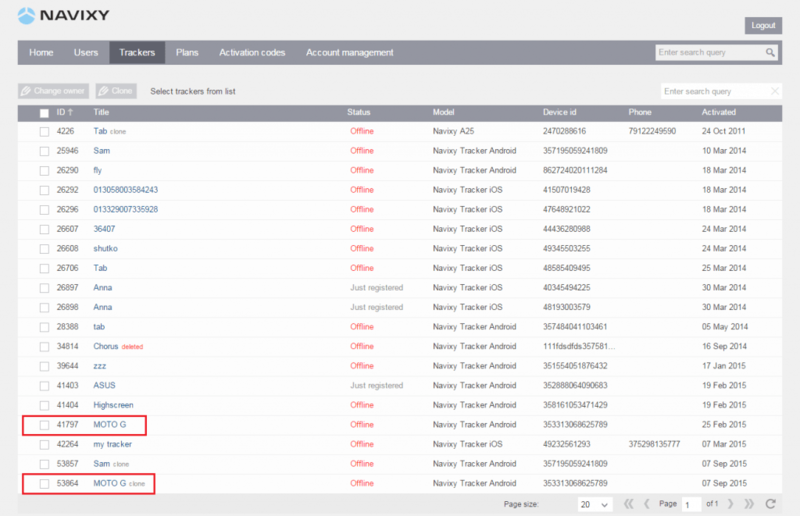 While logged into the Admin Panel click on any tracker you need and press ‘Create clone’. Name your clone and assign it to any desired User (i.e. Clone owner). Save changes and your clone will be ready to get monitored by other User. If you need to change the ‘Clone owner’, simply click on the clone and press ‘Edit tracker’. Should I pay for clones? As far as clones are virtual reflections of trackers you are not going to be charged any extra. You pay only for trackers but not for their clones.